The Friends is excited to announce the launch of a plan to design and install permanent lighting of the statues on each block of the Mall. The first project will be the Morison statue in the Spring of 2019, followed by the Garrison and Collins statues. In addition to lighting installation, this project will include repointing of stonework, restoration of granite surrounds, walkways and turf around each statue as needed. The projected budget for the first three statues is $500,000. 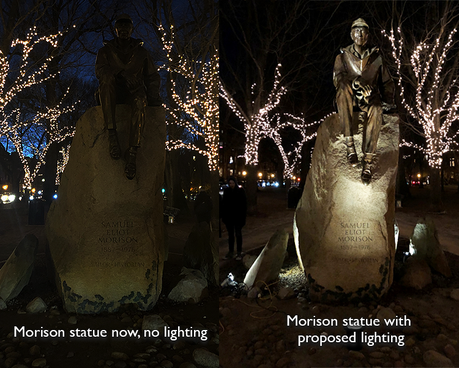 Please join us in this major Commonwealth Avenue Mall improvement project with a donation of any size to the Mall Statue Lighting fund. For more information, email Margaret Pokorny at [email protected], or call 617-723-8144.